After 5 years of work, creation, and planning, we presented the world premiere of the telematic opera Auksalaq. I am so grateful to many people who contributed their time, talent, and energy to this artistic work about climate change in the Far North, especially to my creative partner and composer of the music and libretto, Matthew Burtner. So many people pulled together and pulled off a world premiere for the books. Beset by challenges of Hurricane Sandy, the group performing at The Phillips Collection (who had to cancel due to the storm) went to an entirely new space, re-engineered their dynamics and presented a powerful performance. 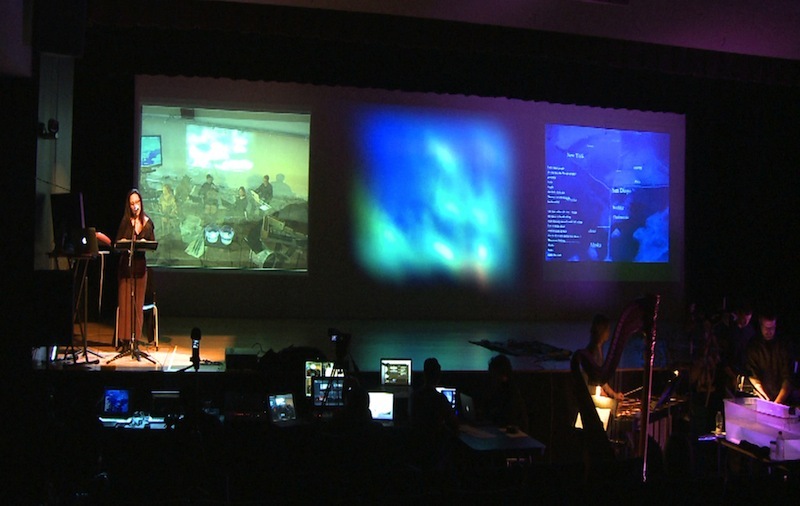 They, together with Norway, Montreal, Alaska and Indiana tech crews worked out a very complex scenario of computer interactivity, music and media and delivered in pitch-perfect fashion. Chuiyuan Meng, David Topper, Michael Scott, Thor Thuestad and Javier Sanchez today are my heroes. Bit20, Telematic Collective, Ensemble Knox, Erzsébet Gaal, McGill Percussion, EcoSono, and Alaska musicians, performed with elegance and artistry. Singers Lisa Burr and Audrey Luna were so inspiring; scientists Hajo Eicken and Mary Beth Leigh were spot-on, NOMADS worked so wonderfully, and Jordan Munson’s artistry was on full display. Producers from Norway to Alaska, thank you for your time, hard work and vision. Due to the storm, we missed Lu Magnus and Phillips Collection partners and we thought about you all evening….here is hoping we get another chance to present with you. Finally, once again, I’ll always be grateful to Matthew Burtner for an amazing collection of music and for being a great friend and co-collaborator on this project. If you want to read more about this amazing piece, please visit the Auksalaq website. You are currently reading Auksalaq World Premiere at Scott Deal.